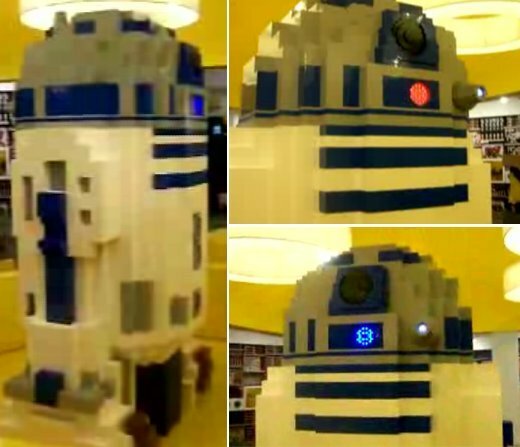 If you’ve ever visited the LEGO Store in downtown Chicago, you might have come across a life-size R2-D2 made from thousands of snap-together plastic blocks. While I thought that was impressive, this mammoth LEGO droid measures in at a whopping 8-feet tall. Built by official LEGO Master Model Builder Dan Steinenger with the assistance of a bunch of visiting kids, the giant R2 unit was assembled as part of the recent Festival of the Masters event at the LEGO Store at Downtown Disney in Orlando, Florida. The giant R2 even had functioning red and blue LED details, and was backed up by sampled sound effects from the popular motion picture series. Looks like R2-D2 can finally see eye-to-eye with Chewbacca and tell him who’s really boss.